Resolve to fix things later, or act now? 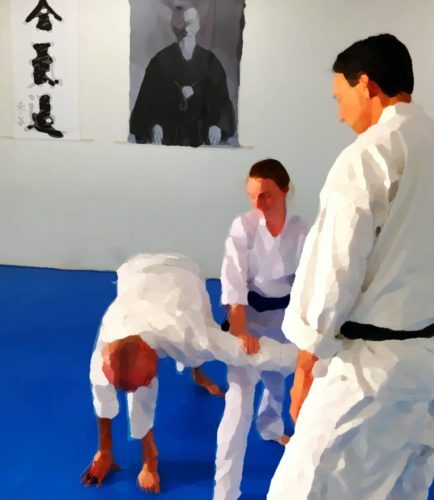 Sensei is always reminding us, “There’s no waiting in Aikido.” We don’t just stand there, hand outstretched, waiting until someone grabs us hard or hits us full force. We sense the situation building. We are in already motion, changing the dynamics of the situation. We turn to draw the attacker toward a position more beneficial to us. They never have a chance to be strong, or get a solid grip. Instead they are off balance and over-reaching from the beginning; easy to defeat. They appear to have slipped and fallen, while we moved out of their way. We are victorious without fighting. Successful without a struggle. So here we are, on the mat of real life. It’s fall. The time changed a few weeks ago. We are not outdoors, in the garden, walking, or riding so much. Maybe it’s raining, or snowing, or just cold and dark outside. Curling up with a good book and a cup of tea sounds appealing. We are busy with school, with work, or with closing out the year. There’s less time to be active. We have more family commitments, travel, gifts to buy, dinners to prepare. The feasting holidays are upon us. Cheesy casseroles take the place of grilled veggies. Trays of colorful cookies appear in break rooms. Leftovers lurk in kitchens. We sense trouble. There are shadowy figures gathering on the other side of the street. There, behind that hedge. But we just stand there, waiting to be clobbered. We hunch our shoulders, hoping nothing will happen, and resign ourselves to our fate. We eat too much, and the wrong things. We give our evenings over to movies and chips. We knew the thugs were there, but we closed our eyes and held our breath. Maybe they wouldn’t jump us this time. But of course they did. The cakes and dips, the cheese balls and chocolates, they pack up together with the soft sofa and the cozy blankets to take us down. They do every year. Before we know it we are in their clutches. We joke about food comas, and whine about weight gain. But behind the laughter we feel sluggish and defeated. Damn it! We let this happen, again. Now, unbalanced and winded, we have to fight hard to get out of this mess. The thugs have one arm behind our backs, a big handful of our hair, and are kicking us in the knees. We resolve, once again, to struggle free of our situation. We will be more active. We will eat less. We will make better choices. Starting really soon. Maybe in a few weeks. It’s too late. We stood there and waited for the attack.We did nothing, and we got pounded. We were damaged by our own inaction, physically and spiritually. We were injured. We failed. Ouch. What if, on hearing the couch and the cookies conspiring at the street corner, we were to act? What if we turn and go another way? What if we face them calmly and say with absolute clarity, “Not this time. Back off.” What if we slip out of their grasp before they ever really get a hand on us? What if, at the end of the day, we had maintained our own integrity, kept our balance, and continued on our way unharmed? What if instead of feeling weak and defeated, we were healthier, stronger, and successful? This holiday season, consider getting off the line of attack. Don’t wait until you are down, hoping you can get back on track later. Act now. Move. Look your attacker in the eye and refuse to be the victim this time. It may look like buying matching raincoats for you and the dog, so you can walk with no excuses. Maybe it’s signing up for a swim club, taking a dance class, or joining a dojo. Don’t wait, get moving.